We like what we like and end up buying and wearing variations of the same things year after year. I am a firm believer in the rule, that one should always know what looks good on them. However, expanding your fashion comfort zone goes hand in hand with that rule. You won’t know if new things do in fact look great on you. Furthermore, let’s be real, fashion styles can become boring if you never trying anything new. I went out of my comfort zone when I purchased these blush pink, faux suede block heels featuring the fuzzy faux fur from Agaci. Stepping outside of your fashion comfort zone doesn’t need to be scary. Think baby steps and you are more likely to be be happier with the result. Start with single items and work them into your wardrobe. I first saw the heels in the store window of Agaci at the mall, and was immediately drawn to them. However, it definitely took me a while to convince myself to purchase them. I actually submitted a picture of these heels to my Facebook group, Thrifting Divas, with a Yay or Nay question. In the end, with a sale price of $18, I walked away with them, promising myself that I would incorporate them in a spring outfit. Yes, I know that you are thinking that these heels sure do look like they belong with a robe in the bedroom. But, since I was stepping out of my fashion comfort zone, I didn’t let the doubts stop me from styling these heels. It’s also the exact reason that I decided to dress it down with super distressed jeans, which also happens to be one of my favorite pair of distressed jeans. I wore this sleeveless jacket that I got from BeBe on clearance last year as well. I have styled it completely differently on the blog here before. 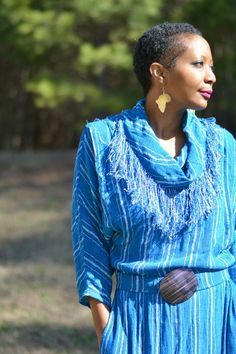 I love the structure and length in this sleeveless jacket. 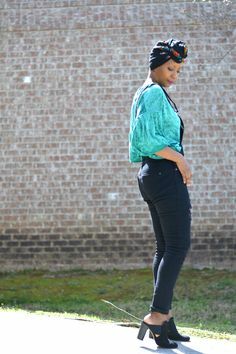 It is also a great balance to this outfit with these fur heels and distressed jeans. I wore a simple white thrifted shirt underneath. Thrift stores are the best places to find those simple layering must have pieces. This shirt set me back $3 from Salvation Army. 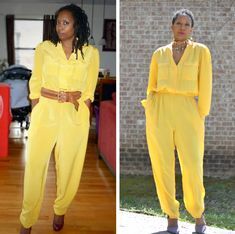 Have you tried incorporating a piece that was out of your fashion comfort zone lately? Recreate this look by shopping below! So comfy & chic and you look Fantastic. I love the hair, lippie, jeans and of course those shooze. Enjoy! Loving this look!! I just bought some furry shoes as well that I was TOTALLY not sure of and out of my comfort zone…this has inspired me to ROCK them! You look great. I love the vest and those shoes are gorgeous. Perfectly styled!